This a very typical job for us a fairly new or brand new glass roof conservatory with solar reflective tinted glass that is still too hot and still to bright to use. 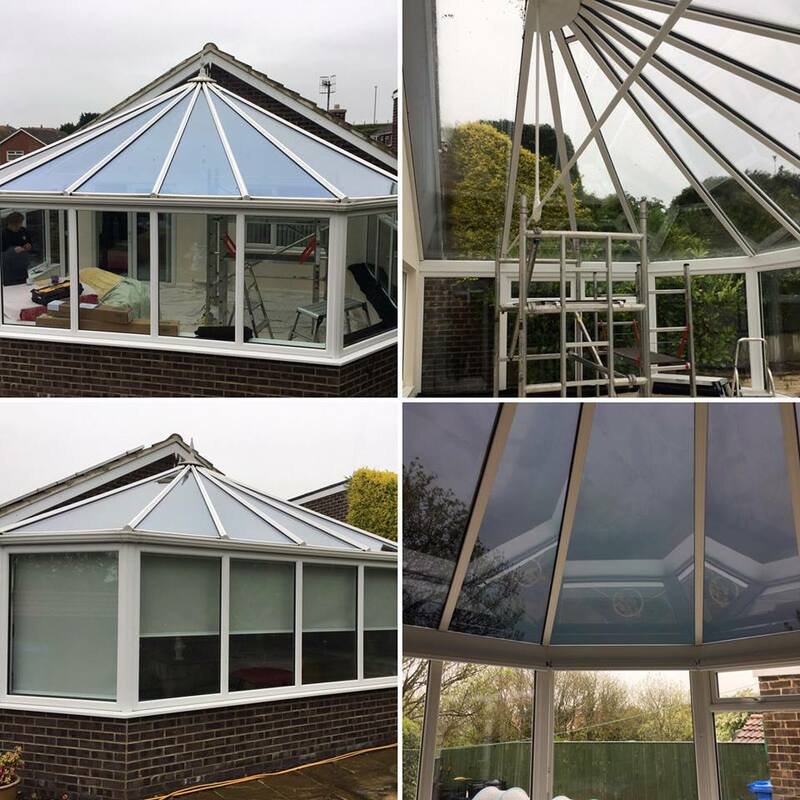 Our specified solar control glass coatings out perform the typical solar glass fitted in todays conservatory’s and also have the added benefit of blocking 99% of harmful Ultravoliet Radiation a major factor in skin cancers and disorders. We are increasingly speaking to customer who were told that their new conservatory don’t have any of the pitfalls of conservatories of old and the simply isn’t true our customers say to us they are just as hot and bright as before. After speaking with customer at length Solargard TrueVue 05 glass coating was put forward and agreed upon reducing at approx 40 – 50% solar heat gain and 95% glare whilst still retaining sky views. This would also give privacy from prying eyes from up the hill through the roof. The customer suggest vertical blinds for the windows and we suggested a better option which allowed full use of the window sill and gave them 100% of their windows back when the blinds ate fully opened as roller blinds don’t gather like verticals. To keep clean lines in the conservatory a commercial blind system was adopted due to being oversized and to make things easier to operate a crank handle for the biggest blind was specified. The customer was initially unsure of the route but once installed was delighted with the results and said they were pleased they had trusted our advice as it looks and works much better for them rather than their 1st choice of verticals blinds.